I hope you had a fantastic 4th of July weekend! We had a blast up at my in-law’s house! We did all the typical Independence Day stuff: swimming, fireworks, BBQ—it was pretty rad. 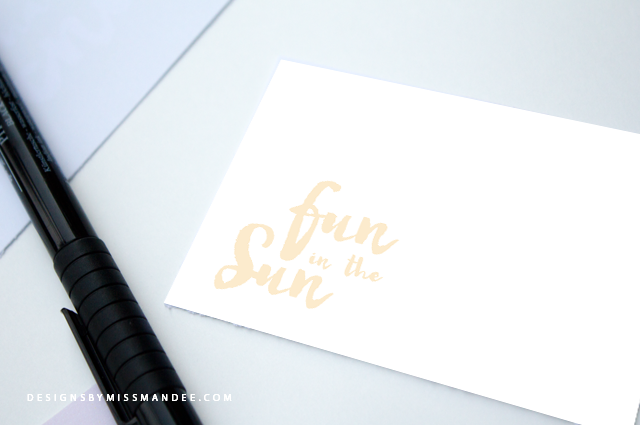 And all that “fun in the sun” was what inspired today’s cute new freebie. 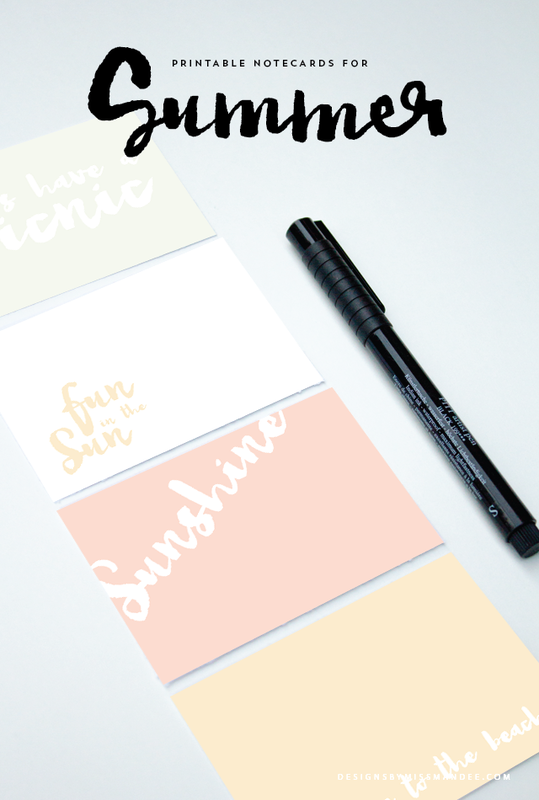 Use these printable notecards for summer crafts, parties, and more! Is there any end to the ways you can use notecards? I love having cute little cards like this on hand. They are great for little neighbor gifts, love notes, handouts, or just to have in your home office. 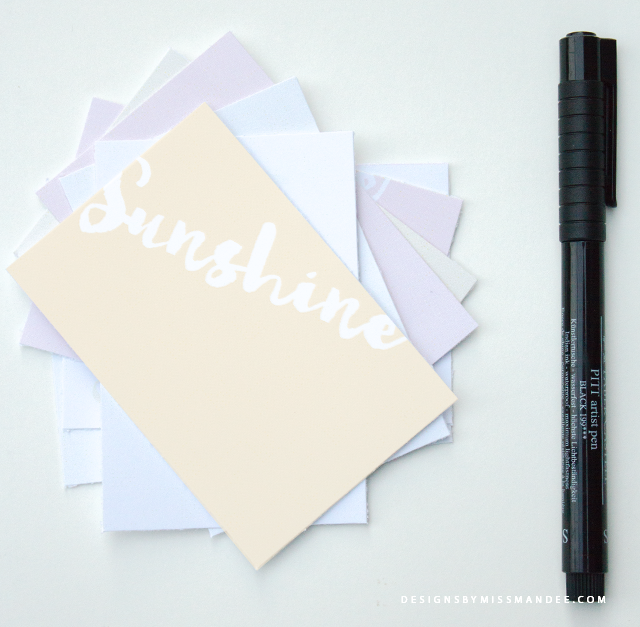 And these notecards are extra special because they include fun summer-themed phrases and colors. Hand-drawn script fonts are all the rage right now in the design world! I recently purchased a font bundle, and have loved taking my new fonts on a test drive. The font I used for these cards is called Snowberry, and it was designed by one of my all-time favorite designers: Angie, from Angie Makes. If you like these notecards, then be sure to check out the floral ones I did back in February. Also, have you seen my Creative Market shop lately? My shelves are finally starting to fill up (cheers from the crowd). My latest products include a bundle of watercolor flowers and some chic blogger toolkits! Be sure to stay tuned, you know, if you like cool designs and stuff. So, what plans do you have for these summer-themed cards? I always love to hear how my readers put my printables and graphics to use! Have a great summer (or HAGS if you’re a middle school student writing in a yearbook)! What cute notecards!! Your designs are fabulous!! Found you on Mama Buzz!! Hey I would love it if you stopped by my place and shared your stuff on My 2 favorite Things on Thursday – Link Party!! I would love to have you! !